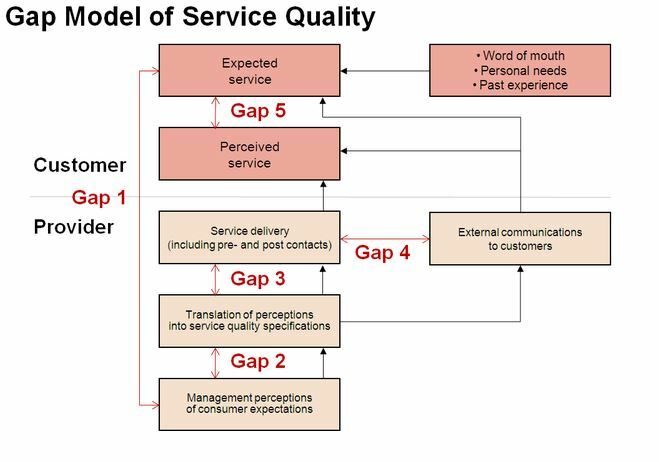 The gaps model of service quality was developed by Zeithaml, Parasuraman and Berry in 1990. It is a useful framework for understanding service quality in an organization. The gap model consists of 5 gaps (one customer gap and four provider gaps). The most critical service quality gap is the customer gap – the difference between customer expectations and perceptions. Closing the gap between what customers expect and what they perceive is critical to delivering quality service. Cultural differences bring another seasoning to the service quality. Customer’s expectations may vary a lot depending on the culture they live in. Also emotions and moods are feelings that influence customer’s perceptions and evaluations of their experiences. Customer’s behavior may have an effect on other customers as well. Different cultures have different temperaments and ways to show their frustration or disappointment. It is said that Japanese smile all the time, and angry Japanese smile even more widely. (Keeping appearances is very important in Asian cultures.) If you open a business in the new culture, you should take some time and effort to get to know the culture your customers (and employees) live in. How to close the customer gap? To close the customer gap, the four other gaps (provider gaps) need to be closed. A service quality audit based on the gaps model would be a solution to reveal existing gaps (audit of service performance and capabilities of an organization). The strategies and decisions made by the management must be based on the need to close the gap between customer expectations and perceptions and to keep it closed. Methods to capture information about customer expectations must be developed through marketing research. A lack of upward communication can be one reason to the listening cap. Frontline employees who meet the customers, don’t bring the information to the management level. From cultural point of you, if your business and employees are in the foreign country, where problems are not spoken out so straight forward as we do in Finland, you need to find a new way to get the needed information. Also a well-defined complaint handling procedure is important. Cultural training may be needed for expatriates to handle face-to-face situations in the new country. Accurate perceptions and service design and customer-driven performance standards are necessary to delivering quality service. Sometimes companies have difficulties in translating expectations into service quality specifications that employees can understand and execute. Servicescape must meet the customer and employee needs. As mentioned above, a fear of losing face in Asian countries may cause the situation where employees don’t admit if they haven’t understood the instructions. Also a language barrier must be taken into account. The service performance gap means a difference between customer-driven service standards and actual service performance by company employees. The firm must have systems, processes and people in place to ensure that service delivery actually matches the design and standards. The standards must be backed up by appropriate resources (people, systems, technology) and they must be effective. Employees should be measured and compensated based on their performance. Companies need to take time in selecting employees and intermediaries. Many western companies have faced surprising problems with service intermediaries (retailers etc.) abroad due to cultural issues. The communication gap is a gap between delivery and providers external communications (promises made to customer may be something the company cannot fulfill – empty promises must never be given). If employees who promote the service do not fully understand the reality of service delivery, the communication fails. How to avoid communication failures? Avoid overpromising, inadequate horizontal communication between sales and operations and inappropriate prizing. Remember that too high price raises expectations (high-level quality is expected based on the high price). Word-of-mouth communication has a huge impact; what customers tell others about the service, has effect on existing or potential customers. Challenges are also caused by social media, blogs, “hate sites” that are impossible to be controlled. The best way to create positive word-to-mouth is to create memorable and positive service experiences. Negative things are remembered more often than positive. If service provider’s native language is not English, there is a good chance for misunderstandings. If the provider comes from another country, a lack of trust may exist, because the customer does not know the company. In China you need to understand the concept of guanxi (a circle of trust; trust plays the key role in the operation of guanxi circles). Also different customers have different tolerance zones (depending on the level of the service the customer has got used to). The predicted service is the level of service the customer believes to get. A globalization has opened doors and created new opportunities, but it also requires a lot and sets new challenges. Journal of marketing – Vol. 49. No. 4. Autumn 1985. A conceptual Model of Service Quality and Its Implications for Future Reasearch. Journal of marketing – Vol. 53. No. 2. Apr. 1989. A Gap Analysis of Professional Service Quality. Zeithaml, V.A. ; Bitner, M.J; Gremler, D.D. Services marketing: integrating customer focus across the firm. Boston. 2006. I agree that nowadays the role of World-to-mouth has become increasingly important because of social media. Blogs, Twitter and Facebook are a good way to give direct feedback on services to the service provider, but can also have a huge influence on public opinion worldwide. Some of you might remember the “balloon gate”, an incident involcing Stockmaan last year where a guard took a ballon given to a child back. Even though the guard acted according to the stores instructions and was polite, there was a huge social media outcry when a video of the incident started spreading. (link: https://www.youtube.com/watch?v=kVoanqKUye0). Stockman tried to first bury the comments, but in the end had to make a public apology. Unfortunately the damage had already been done to their public image. When this kind of crisis happens to a globally operating company, the impact might be unimaginable. I read that in the USA there was a boycott of Chick-Fil-A, an american fast food chain because of CEO Dan Cathy’s contributions to paleoconservative anti-gay organizations. This is clearly because of shared values of the consumers in different parts of the USA. It is very true (like you wrote) that “negative things are remembered more often than positive”. I do disagree somewhat that it is impossible to control social media, but it does take a good eye, understanding and humility to do control damage in the right way. This is why every company should have a good crisis management strategy that includes a social media plan. Thanks for the blog ! Understanding the culture and context is becoming highly important for any globalized service to sustain and do well internationally. I somewhat agree to the saying that “Culture eats strategy for breakfast”. Sometimes great ideas fail miserably in big markets because of lack of understanding of the culture and context. Solution to understanding a context and culture may lie in engaging and getting involved with local people to truly understand their perspectives and ways. Also social media could play a role here , for e.g., using context / culture related social media in a wise manner may give good leads and hints about the ways and perspectives. Also as commented earlier by Leena, keeping a positive image all around social media could be impossible, but an immediate correction should be done if one sees that there is a flow of negative emotion related to the service in social media. We are living in one of the most fascinating time of history where the world seem to be getting closer as a whole and becoming more interactive and expressive which certainly leads to greater things. One just need to have an open mind and interest to understand the culture and context.